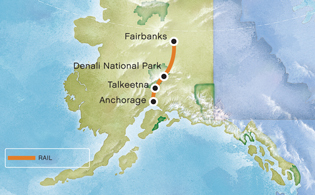 Experience our luxury domed railcars traveling from Fairbanks to Anchorage. With a night in Denali National Park, and a night at Talkeetna, there’s ample time to experience the abundant wildlife and to visit viewpoints for the "Great One". This tour includes rail travel aboard luxury railcar to the Denali National Park rail depot, rail travel to Mt. McKinley/Talkeetna, transfer and baggage handling to and from a Denali area lodge and the Mt. McKinley Princess Wilderness Lodge, 1 overnight at a Denali area hotel, 1 overnight at Mt. McKinley Princess Wilderness Lodge and rail travel to Anchorage. Anchorage accommodations and travel to and from the Anchorage railroad depot are not included. Wake up for optional morning activities. Later, re-board the train and begin the journey to Anchorage. Your vacation in Alaska comes to a close at the railroad depot.